I guarantee there are people selling this on the AppStore: the deal is making the google reader webapp run without the adress bar on top, and thus making it look like a normal app. 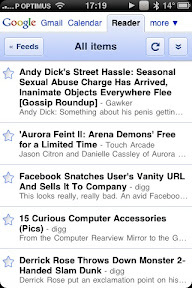 http://dl.dropbox.com/u/145796/greader/index.html then add the bookmark to your homescreen. Done.